The name Kogarasu-maru (小烏丸), lit. “the little crow”) is surely well known to anyone who has become somewhat acquainted with the Japanese sword. In this chapter I would like to go into greater detail on the subject of the Kogarasu-maru and its traditions because, apart from the outward appearance and the connection with the Taira family, not much is known about this sword beyond specialist circles. I want to start with the theories about the naming and the provenance of the sword because there exists basically five in all. Along this story I briefly mentioned one of the traditions, namely the one which is found in the scroll on swords (Tsurugi no Maki, 剣の巻) of the Heike Monogatari (平家物語). *1 Hachimantarō Yoshiie´s (源八幡 太郎義家, 1039-1106) fourth son Minamoto no Tameyoshi (源為義, 1096-1156) once owned the famous sword shishi no ko (獅子ノ子, lit. “lion cub”). He had made an exact copy of the shishi no ko, accordingly by a master smith from Harima province, because he was of the opinion that one lion cub is too lonely. It turned out that the copy was an excellent masterwork and so Tameyoshi ordered a splendid mounting for the sword. The menuki ornaments of the hilt were made in the shape of crows and so he called the sword kogarasu. As mentioned in the first volume, the kogarasu was originally 6 mm (2 bu) longer than the original and so the shishi no ko acted upon its own initiative and cut off the oversize of the kogarasu. However, today it is assumed that this anecdote has another background, namely that for whatever reason the metal mekugi peg – which was connected to the menuki on such old mountings – broke and so the tang sunk 6 mm deeper into the hilt. So the next time when Tameyoshi drew it it seemed that both swords had miraculously the same length. Anyway, because of this „incident“ Tameyoshi give the shishi no ko its original name tomokiri (友切, roughly translates as “equal cutter”). *2 Subsequently the sword came into the possession of Tameyoshi´s son Minamoto no Yoshitomo (源義朝, 1123-1160). Minamoto no Yoshiie from Kikuchi Yōsai´s Zenken Kojitsu. If we believe the sword scroll of the Heike Monogatari, then the Kogarasu-maru was originally in the possession and a heirloom of the Minamoto and not of the Taira family, as the established theory says. But in the Heiji Monogatari (平治物語)*3 we find an entry which says that the sword was worn three months after the death of Yoshitomo by Taira no Shigemori (平重盛, 1138-1179), namely in the context that Shigemori had killed Yoshitomo´s oldest son Akugenta Yoshihira (悪源太義平, 1141-1160) with it in a duel in front of the Shishiden hall (紫宸殿) of the Imperial palace. The entry says that “Shigemore wore the sword called Kogarasu” but it could be that he just took it from the dead Yoshihira and made it the treasure sword of the Taira clan. The second theory about the naming of the sword goes back to emperor Kanmu (桓武天皇, 737-806, r. 781-806). 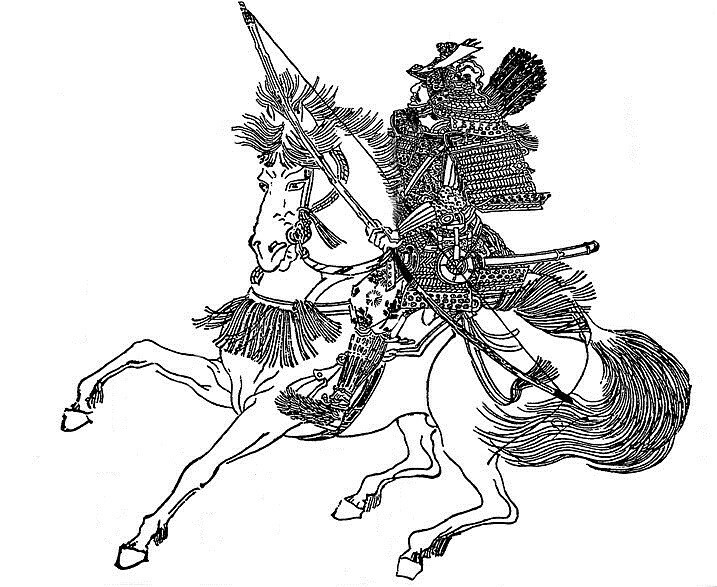 Kanmu was the one who carried out the move of the Imperial capital from Nara to Heiankyō. One day he visited the newly finished southern hall and looked pleased into the sky. Suddenly he saw a crow flying between the clouds which carried something. He tried to lure the bird with his wooden sceptre and succeeded. The crow turned around, landed in front of him, and started to talk: “I am a messenger of the grand shrine of Ise and I have a sword for Your Majesty!” She cleaned her plumes a bit, jumped around and dropped the sword she was talking about. Due to this incident emperor Kanmu called the sword Kogarasu-maru. According to the sword appraisal protocols of the Utsunomiya family (宇都宮),*4 this legend goes back to an oral tradition of the Kamakura-period general Yana Gyōbuzaemon Nyūdō En´a (簗刑部左衛門入道円阿). As Kanmu descended from the Taira family, this brings us back to the established theory that the sword was a heirloom of this clan. They pursued Masakado until Sashima (猿島), in Shimōsa province, where he hid in a mansion. It was decided to smoke him out but suddenly eight men came out of the house as Masakado possessed the secret “Art of the Doppelganger” (bunshin no jutsu, 分身の術), being able to make copies of himself. As there was some confusion among the besiegers regarding who was the real Masakado Sadamori cut down with his settō one who had a crow-like helmet ornament. It turned out that this was the “real” Masakado and so he gave the sword the nickname Kogarasu-maru. But old historical documents say that emperor Suzaku did not give Sadamori a sword but a so-called daijō-kanpu (太政官符), an official letter for his legitimacy. And the texts say also that Masakado was struck by an arrow of Sadamori, fell down from his horse and died that way. Taira no Tadamori from Kikuchi Yōsai´s Zenken Kojitsu. In the Heiji Monogatari we find another entry concerning the Nuke-maru. The book says that it was worn by Tadamori´s fifth son Taira no Yorimori (平頼盛, 1133-1186) during the Heiji Rebellion when he encountered the giant Hachimachi Jirō (八町次郎). It came to a chase on horseback and Jirō was able to hook his huge rake into Yorimori´s tehen (天辺), the small round opening on the top of a Japanese helmet. So he pulled him down from his saddle but Yoshimori drew the Nuke-maru and severed the pole of the rake. In turn, Jirō fell from his horse and was killed by Yoshimori. As proof of this incident Yoshimori returned to the Taira palace with the rake still in the tehen. 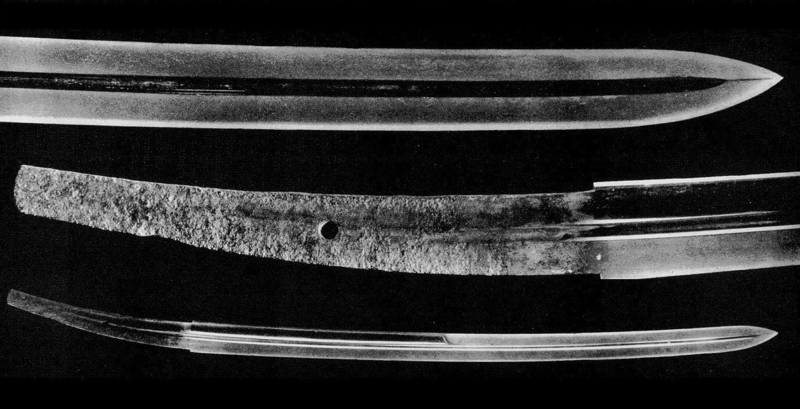 But most experts assume that the Kogarasu-maru and the Kogarashi were two different swords, which were both handed down within the Taira family. The Kogarashi was often listed in old sources as the Kogarashi-maru (木枯丸) and so it is likely that some later chroniclers mixed that up and constructed a non-existing relation between the two swords. *6 Another “proof” that there were two swords are their different provenances after the time of Tadamori. These provenances are found in Hanawa Hokiichi´s (塙保己一, 1746-1821) Buke Myōmoku Shō (武家 名目抄) and it says that Tadamori bequeathed the Kogarasu-maru and the Kogarashi to his oldest son and heir Taira no Kiyomori (平清盛, 1118-1181). Kiyomori kept the Kogarasu-maru and presented the Kogarashi to his younger half-brother Yorimori. The former was then handed down within the Taira mainline and the latter became the treasure sword of the Yorimori lineage. Yorimori gave the Kogarashi to his son Taira no Yasumori (平保盛, 1157~1233), Yasumori to his son Taira no Yorikiyo (平頼清), and Yorikiyo bequeathed it to his son Taira no Yasukiyo (平保清). Let us now turn to the subsequent history of the sword. So at the end of the Heian period, the Kogarasu-maru was in the possession of the Taira family or, to be more precise, of Kiyomori´s heir Taira no Koremori (平維盛, 1158-1184). The Taira suffered a crushing defeat at Ichinotani (一ノ谷) and many clan members fled by ship to Yashima (屋島) on the Shikoku island. Amongst them was Koremori who gave orders that the Kogarasu-maru and the hereditary armour Karakawa no yoroi (唐皮の鎧) should be given to his son Takahira (平高清, 1173-1199) so that they could be handed down within the family. Koremori committed suicide by drowning in the sea. The sword did not reach Takahira but was taken into custody by Koremori´s older half-brother, Taira no Tomomori (平知盛, 1152-1158). Tomomori, for his part, committed suicide in the subsequent Battle of Dannoura (壇ノ浦) by binding an anchor to his legs and jumping into the sea. It is now assumed and noted by some chroniclers that the Kogarasu-maru was also lost in the chaos of the Genpei War. The three Imperial regalia also suffered the same fate when the six years old emperor Antoku (安徳天皇, 1178-1185) drowned. Wada Yoshimori from Kikuchi Yōsai´s Zenken Kojitsu. But the sword book Tenbon Mei Zukushi (天文銘尽) says that the Kogarasu-maru passed from Wada Saburō (和田三郎, 1147-1213) to Ashikaga Yoshiuji (足利義氏, 1189-1255). Wada Saburō, his official first name was Yoshimori (義盛), was, at the time of Ichinotani and Dannoura, director (bettō, 別当) of the so-called “board of retainers” (samurai-dokoro, 侍所). According to the Heike Monogatari, he crossed with his small boat between the enemy ships firing numerous arrows. So we can assume that he didn’t carry the precious Kogarasu-maru during these actions. Yoshiuji, on the other hand, was an ancestor of the famous Ashikaga Takauji (足利尊氏, 1305-1358). The bakufu troops under Yoshiuji´s command beat the Wada in the third year of Kenryaku (建暦, 1213) and this was probably when the Kogarasu-maru came as a war spoil into the possession of the Ashikaga family. The “problem” is that this provenance is only found in the Tenbon Mei Zukushi. All other old sword documents of the Nanbokuchō and early Muromachi period don’t mention the Kogarasu-maru, neither in connection with Yoshimori nor with Yoshiuji. Sadatake contradicts the old provenance of Takahira and Tomomori. He writes further that his ancestor Ise Sadataka (伊勢貞孝) and his oldest son Sadayoshi (貞良) died fighting in and around Kyōto in the fifth year of Eiroku (永禄, 1562). Sadayoshi left a five years old son called Torafukumaru (虎福丸) who, for safety, was taken to Obama (小浜) in Wakasa province, with the Kogarasu-maru. There it was feared that the precious sword would get stolen and so it was given to the care of Sadayoshi´s younger brother who was a monk in Kyōto. Later, when Torafukumaru came of age – he then bore the name Sadatame (貞為) – he bequeathed the Kogarasu-maru to his son Sadateru (貞輝) who, through the agency of his maternal aunt, went to Edo into the service of shōgun Tokugawa Iemitsu (徳川家光, 1604-1651). Sadateru´s great-grandson, by the way, was the father of Ise Satatake. Sadateru´s aunt was the famous court lady Kasuga no Tsubone (春日局, 1579-1643). She offered the Kogarasu-maru to Tokugawa Iemitsu as a present, but after a “cooling-off period” of ten days he suggested that it would be better if the sword remained within the Ise family because they had taken care of it for several hundred years. Well, at the time of Sadatake, contemporary sword experts and chroniclers were obviously sure that the Kogarasu-maru of the Ise family was the real thing. Either Sadatake was so convincing with his provenance or they had other information that we do not know of today. During the Meiji era (明治, 1868-1912) count Sō Shigemasa (宗重正, 1847-1902), whose family had previously ruled the Tsushima-Fuchū fief (対馬府中藩), eventually bought it. The Sō claimed that they were descendants of the Taira-lineage on Tomomori’s side, which would close the circle. In the end, in 1882, Shigemasa presented the Kogarasu-maru to emperor Meiji (明治天皇, 1852-1912). The gyobutsu Kogarasu-maru, nagasa 62.7 cm, sori 1.3 cm. After all these stories, let us focus on the sword itself. As mentioned before, and seen in the above picture, the Kogarasu-maru extant today is forged in kissaki-moroha-zukuri. This blade shape was popular during the Nara period but extant swords from that time – like for example the specimen in the Shōsō´in (正倉院) – have a noticeable shorter cutting-edge on the back. The nakago of the Kogarasu-maru from the Tsuguhira Oshigata. But we know of a drawing by Hon´ami Kōetsu (本阿弥光悦, 1558-1637) which shows a date and a signature (see picture above). This drawing was later published again in the Tsuguhira Oshigata (継平押形). *8 It must be noted that the drawing of the blade and tang by Kōetsu is identical with the extant gyobutsu in terms of length, proportions, position of the mune-machi and ha-machi and the mekugi-ana. The tang is quite corroded so we can’t make out any signature today but this does not mean that there was no mei visible at the time of Kōetsu, i.e. during the early Edo period. This would also explain the very fine and incomplete reconstruction of the signature in the Hon´ami Kōetsu Oshigata. This signature reads: “Amakuni (天国)*9 – Taihō ?-nen ?-gatsu“ (大寳？年？月).” The Taihō (大宝) era is noted with the characters in use at the time of Amakuni, i.e. with (寳) for hō. The year is only partial visible, all we can see is a curved stroke to the bottom right. So it could be either an eight (八) or a two (弐). *10 Because the Taihō era lasted only for four years, the eight can be dropped and we get the second year, i.e. 702. The smith Amakuni was also dated in old sword documents to the Taihō era and this would tally with the date of the Kogarasu-maru. But we have to be cautious. It is possible that the date Taihō was “read” by Kōetsu with a great deal of good will and the information in mind that Amakuni was supposedly active around Taihō. Let us take a look at the mounting of the Kogarasu-maru. Already Ise Sadatake notes that the hilt wrapping are loose and that the metal fittings through which the suspension was slung were broken. This mounting is said to have been made in the second year of Ōnin (応仁, 1468). That means it is possible that the original one was destroyed by fire in the course of the Ōnin War which started in 1467. Count Muneshige said that the mounting was even more damaged when he bought the sword and that he had it restored because he didn’t want to hand over a sword to the emperor in such a bad condition. 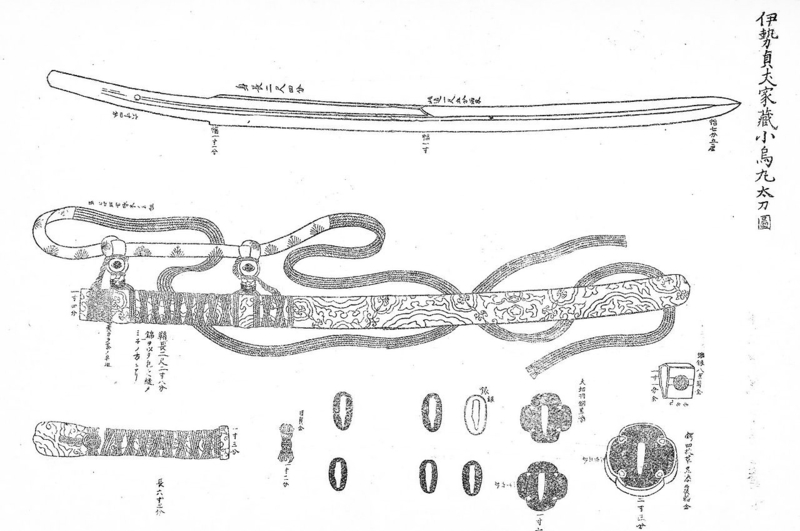 The picture below shows Sadatake´s drawing of the blade, the mounting and its parts. The depiction of the Kogarasu-maru from the Shūko Jisshu. The depiction is from the Shūko Jisshu (集古十種), a 85-volume catalogue covering ten categories (jisshu, 十種) of antiques (shūko, 集古), commissioned in the twelfth year of Kansei (寛政, 1800) by Matsudaira Sadanobu (松平定信, 1759-1829), the then daimyō of Shirakawa. Incidentally, the Shūko Jisshu shows a menuki in the form of a so-called sankozuka (三鈷柄), the hilt of a Buddhist ceremonial sword and no longer a crow that the Heike Monogatari pointed out as the original shape of the menuki. For the sake of completeness I would like to introduce at the end of this chapter the “other” Kogarasu-maru. It is a sword which was handed down within the lineage of Kiyomori´s younger half-brother, Taira no Tsunemori (平経盛, 1124-1185). 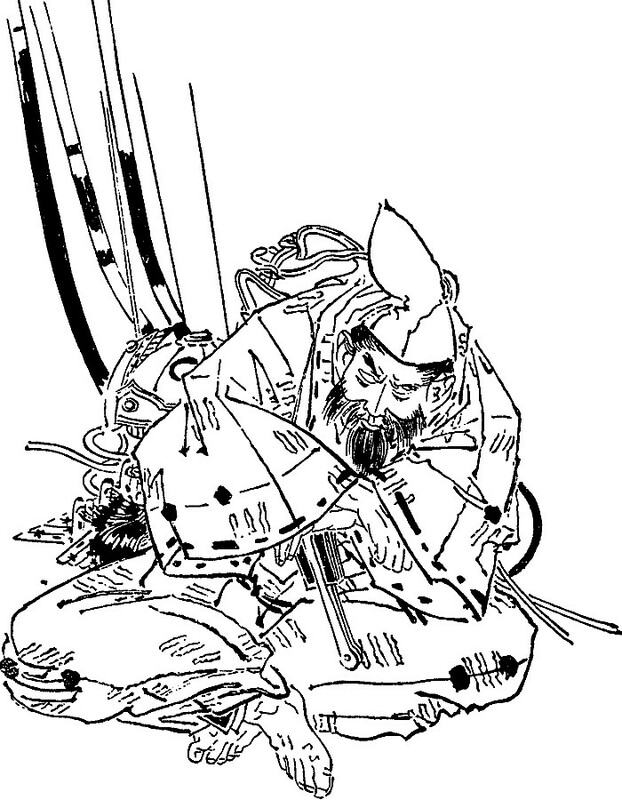 Tsunemori died in the Battle of Dannoura and left a two year old son, begotten from a mistress. This son was taken into the family of regent Hōjō Tokimasa (北条時政, 1138-1215) who left him in the care of his eldest son Yoshitoki (義時, 1163-1224). The latter took later the family name Ema (江間) and the tradition says that with the coming-of-age ceremony (genpuku, 元服), Tsunemori´s son was given the name Ema Terutsune (江間輝経). Terutsune had to flee later to Hida province due to slanders but took the Kogarasu-maru with him. Terutsune´s successor and 17th generation was Ema Terumori (江間輝盛, 1533-1582) who was in turn a retainer of the Takeda family (武田). When Tokugawa Ieyasu ordered his warrior Kanamori Nagachika (金森長近, 1524-1608) to attack the Ema in the tenth year of Tenshō (天正, 1582), Nagachika returned with the Kogarasu-maru as a spoils of war. As a loyal vassal he tried to present it to Ieyasu who he refused and said: „This sword is connected with the Taira family. It is of no use for a man like me who is a descendant of the Minamoto clan.“ And so it was offered to the Kokubunji (国分寺) in Hida´s Takayama (高山) where it is kept until today. It is designated jūyō-bunkazai, has a nagasa of 75.7 cm and is attributed to the swordsmith Mitsuyo (光世)*11 who was active around Shōhō (承保, 1074-1077) in Miike (三池), in Chikugo province. Some assume that the nickname of the sword goes back to the deep black saya which reminds us of the plumage of a crow. The jūyō-bunkazai Kogarasu-maru from the Kokubunji and its mounting. An interesting version of this tradition explains how the Kogarasu-maru, i.e. the one which is now a gyobutsu, came into the possession of Ise Sadatake. According to this version, Terumori was killed by a certain Ushimaru Chikamasa (牛丸親正), who was a retainer of Kanamori Nagachika. Chikamasa offered the sword to Hida´s Kokubunji who sold it some years later to a wealthy person from Toyama (富山) of Etchū province. But in Keichō seven (慶長, 1602), the sword was again bought by a person from Hida who returned it to the Kokubunji. An enterprising monk saw his chance and tried to turn this famous sword into cash in the new capital Edo. But he was cheated by a dealer who acted through an agent and left the monk without the sword and only a small deposit. After that the trace of the Kogarasu-maru was lost until Ise Sadatake rediscovered it more than one hundred years later in an antique shop. But this story does not explain why there is a Kogarasu-maru still preserved in the Kokubunji and is probably a mix-up of several oral traditions. *1 The Tale of the Heike is an epic account of the struggle between the Taira and the Minamoto clans for control over Japan at the end of the 12th century. It is considered as one of the great classics of medieval Japanese literature. *2 The sword had already cut off 3 sun (~ 9 cm) from its “competitor,” the makuragami (枕上, lit. “at the cushion”). *3 This works deals mainly with the course of the so-called „Heiji Rebellion“ (Heiji no ran, 平治の乱) of the years 1159-1160. *4 Utsunomiya Mikawa Nyūdō Mekiki Sho (宇都宮三河入道目利書). 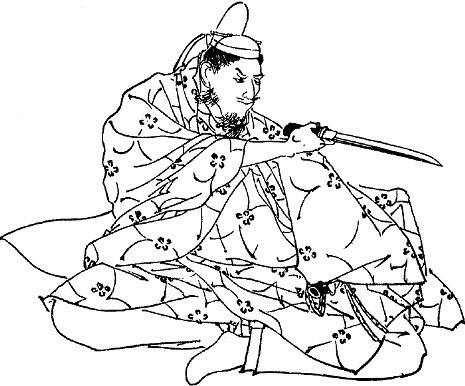 Utsunomiya Mikawa Nyūdō was one of the most important sword appraisers of the Nanbokuchō period. *6 The theory that the Kogarasu-maru and the Kogarashi were the same sword is found, for example, in the Nōami Hon Mei Zukushi (能阿弥本銘尽), not in the original version of Nōami Shinnō (能阿弥真能, 1397-1471) but in a later revised edition. *8 The drawing by Hon´ami was first published in the eighth year of Keichō (慶長, 1603) in the Hon´ami Kōetsu Oshigata (本阿弥光悦押形). The Tsuguhira Oshigata from 1928 is based on a collection of drawings of the treasure swords of Tokugawa Hidetada (徳川秀忠, 1579-1632), made by the Edo swordsmith Ōmi no kami Tsuguhira (近江守継平) around Genroku (元禄, 1688-1704). *9 Obviously Kōetsu was only able to recognise the outer radical (口) of the character Kuni. *10 (弐) is the variant of the character (二) used for legal documents and the like. In the Chōkyō Mei Zukushi we even read the exact date of the signature, namely the 25th day of the eighth month of Taihō two. Maybe during the Chōkyō era (長享, 1487-1489) more parts of the signature were legible. *11 Because of the characteristic yaki-otoshi (a hamon which does not start immediately at the hamachi), some attribute the sword to Bungo Yukihira.